1. Combine chuck, evaporated milk, onion, green pepper, salt, seasoned pepper and chili powder in large skillet. Cook over medium heat until browned, stir occasionally. Add flour, stir well. Add tomato sauce, chili beans and olives. 2. Lightly grease 1 1/2 quart casserole. Cover bottom of casserole with 4 corn tortillas. Pour in meat mixture and top with more corn tortillas. Bake 30 minutes at 350 degrees. Optional--may top with grated cheese before serving. 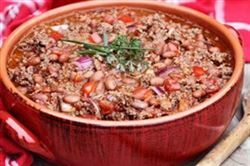 Enjoy this delicious chili con carne beef Mexican recipe!